A team of physicists and chemists from UNIVERSITY OF BRISTOL created this diamond with electric current that can last longer than the history of human civilization and more interestingly, it is powered by nuclear waste. Nuclear power has much more advantage compared with fossil fuel but when it comes to byproduct, nuclear waste is more harmful. The reason is that nuclear waste stays dangerously radioactive for thousands of years. So instead of dumping nuclear waste deep under Earth's surface, it can be used for making artificial diamonds which can provide current. How is this artificial diamond battery is made? Scientists used radioactive Nickel-63 for their first model and working on Carbon-14 for next model.Carbon-14 is the radioactive form of same element diamonds are made of. In nuclear reactors Carbon-14 is found on the outside of graphite blocks which moderates the nuclear fission process enabling a controllable chain reaction. When the usage of this graphite blocks are over, the radioactive Carbon-14 on the outside wall of the blocks are removed by heating and this isotope of carbon is then made into radioactive diamond at low pressure and high temperature. This small diamond generate electric current when placed ina radioactive field . 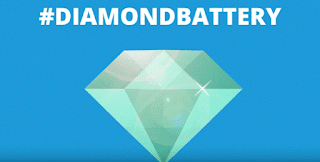 This gives a nuclear powered diamond battery. But still it is radioactive. For using it, another non radioactive diamond layer is formed around the radioactive diamond which completely absorb all the dangerous radiations and converting it into even more electricity. This final diamond product emits radiations less than that a single banana emits making it 100% efficient and safe to handle. Radioactive Carbon-14 has a half life of 5730 years making it long lasting. So it can be used in satellites and even in pacemakers. The development of this new technology solves some of the problems for nuclear waste, clean electricity generation and battery life truly taking us into the DIAMOND AGE of power generation.